SUBHEAD: New insight on the spread of contamination from Fukushima Daiichi nuclear disaster. 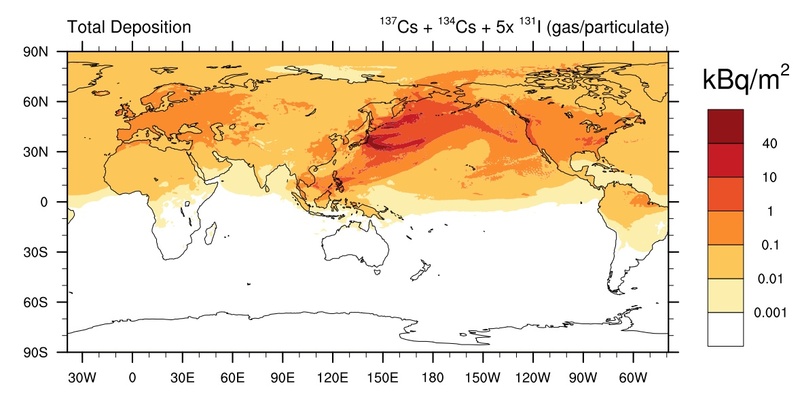 Image above: Worldwide atmospheric distribution of radioactive Cesium and Iodine from Fukushima Daiichi. From European Commission report below. Click to embiggen. 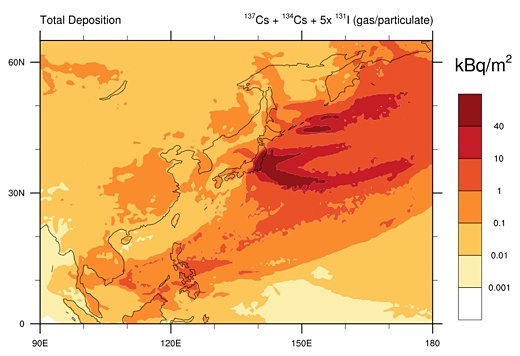 Image above: East Asian atmospheric distribution of radioactive Cesium and Iodine from Fukushima Daiichi. From European Commission report below. It focused on radionuclides that were emitted as gases [...] The International Atomic Energy Agency defines ’contamination’ as the presence of a radioactive substance in quantities more than 40 kilobecquerels per m². [...] land area affected by radioactivity from both types of radionuclides above this threshold is approximately 34,000 km² of Japan, inhabited by around 9.4 million people. 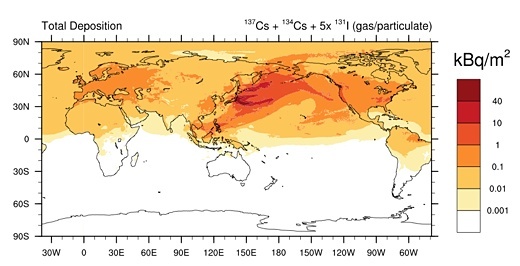 However, the estimate used for the iodine radionuclide emissions from the incident is considered to be an underestimate. 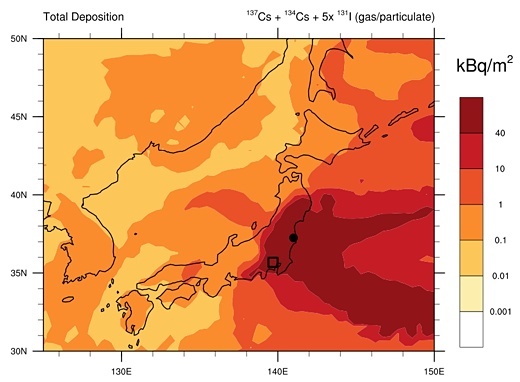 Image above: Japanese atmospheric distribution of radioactive Cesium and Iodine from Fukushima Daiichi. From European Commission. Note Black circle is Fukushima Daiichi NPP. Black square is greater Tokyo. We estimate that the land area affected by the deposition of radioactivity in excess of 40 kBqm² is approximately 34,000 km². [...] this part of Japan is inhabited by 9.4 million people. The surface area that received a total deposition greater than 10 kBqm² encompasses parts of the Tokyo metropolitan area, and approximately covers 60,000 km2, being inhabited by 46 million people. We emphasize that this is based on the emission of 150 PBq 131I estimated by Chino et al. (2011), which might actually be a factor of five too low.